Verifone’s Vx510 is the ideal choice for merchants who know exactly what they want today. 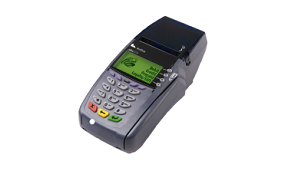 The Vx 510 efficiently processes debit and credit payments, as well as supports value-added applications. Clerks can easily hand over the lightweight, ergonomic device to customers for PIN entry. The Vx 510â€™s backlit display, easy-to-read menu prompts and intuitive ATM-style interface reduce the chance of entry errors by customers and clerks. In addition, the deviceâ€™s integrated high-speed thermal printer and internal PCI PED approved PIN pad keep your countertop clutter-free. The Vx510â€™s high-speed dial modem and VeriCentre file compression enable fast application downloads and processing.